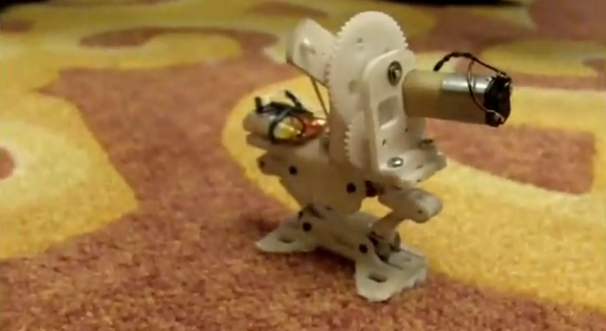 Tiny robots, while adorable, often have limited functionality because of their small stature. Tiny robots that can jump are able to clear large obstacles with minimal energy output - the problem is that, having jumped and landed once, the robot has to get up and redirect itself before it can jump again, and treating all three of these mechanisms individually can bog down a little robot with too many subsystems. Recently, though, a Michigan State University research group led by Jianguo Zhao built a robot that can jump, right itself, and aim using just one motor. The robot is impressively bitty, standing eight centimeters tall and weighing in at only 20 grams. It can jump more than half a meter straight up, and a video from the project shows it clearing two human-sized steps and leaping from a floating platform with little loss of height. Driven by a single pager motor, the robot uses gears for both jumping and rotating, and a small set of arms pushes it back upright after landing. The single gear on the bot pulls the body of the robot down, folding its legs and charging its torsional springs. Once the springs are fully wound, the gear trips a lever that releases the springs’ energy, and the bot goes flying. Of course, it lands flat on its little non-face, whereupon the pager motor can be driven in reverse - the gear spins against the ground, which lets the robot rotate to a new direction. When the robot’s gear is next engaged, tiny arms fold outward and push the robot off the ground as its springs charge, leaving the bot upright, aimed correctly, and charged for its next jump. The research team wants to optimize the robot so it can jump even higher, and the addition of sensors can help it with self-direction and gathering information. In the meantime, the little guy can practice its frog impression.